Editing your color configuration is quick and easy with the Color Configurator. Here you can modify MOST of the colors on your site, but not all. This is not as robust as the CSS Editor, due to the limit of the number of options. Then head to the Color Configuration option, found under "Layout"
This will take you to the Color Configurator, which has a series of options on the left, and on the right is a mini-demo of your site. Click on the color you want, and it'll auto-enter the HTML Hex Color Code into the selected field. If you don't wish to change the color there, you can click the "X" found in the corner. When you're ready to preview your changes, click the "Preview" button at the bottom. 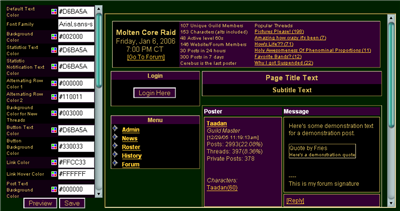 Your color configuration will be loaded and previewed in the pane on the right. If everything looks good to you, then click "Save" and your changes will be saved. You may need to reload the page to see them take effect on your whole site. Editing your color configuration is quick and easy with the Color Configurator. Here you can modify MOST of the colors on your site, but not all. This is not as robust as the [guide=css]CSS Editor[/guide], due to the limit of the number of options. 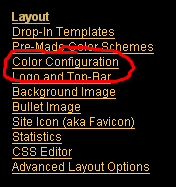 To work with the Color Configurator, you'll want to head to the Admin menu [img]faq/adminmenu.png[/img] Then head to the Color Configuration option, found under "Layout" [img]faq/colorconfigurator.png[/img] This will take you to the Color Configurator, which has a series of options on the left, and on the right is a mini-demo of your site. 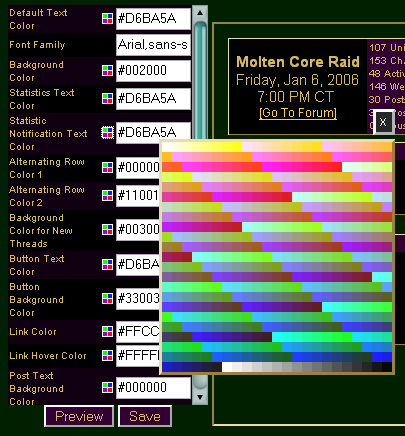 [img]faq/colorconfigpage.png[/img] The fields you can edit are found on the left [img]faq/colorconfigleft.png[/img] These fields use HTML color codes in hex format, with the "#" in front of them. 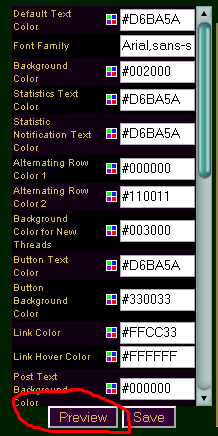 If you are familiar with [url=http://www.computerhope.com/htmcolor.htm]HTML color codes[/url] and how they work, you can enter the values there yourself. If you are not, however, we have a tool to help you pick your colors more easily. Clicking the [img]colorpicker.png[/img] (which is highlighted in the previous image) will bring up a color picker: [img]faq/colorconfigpopup.png[/img] Click on the color you want, and it'll auto-enter the HTML Hex Color Code into the selected field. If you don't wish to change the color there, you can click the "X" found in the corner. When you're ready to preview your changes, click the "Preview" button at the bottom. [img]faq/colorconfigpreview.png[/img] Your color configuration will be loaded and previewed in the pane on the right. If everything looks good to you, then click "Save" and your changes will be saved. You may need to reload the page to see them take effect on your whole site.